The Director's Chair: How deep? Commitment deep. I am bicyclist, though not for my love of Spandex. You may have seen me riding downtown, out by the Art Museum, riding down Kelly Drive or out in Old City. By default, I’ve bec ome a full-time committed commuter. However, there are drawbacks to this undertaking. I’ve made this commitment during comfortable summer months. Well aware of an imminent winter, I ready myself for the cold. Pictured here is my riding/racing jersey. I am a novice racer. 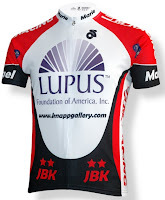 Having lost my mother to Lupus, I also ride/race to raise awareness about a debilitating disease that attacks all vital organs. Despite 50 years of research we still have no cure. I started riding just 6 months ago. I made an investment in myself. One could also say I rewarded myself for having finally quit smoking cigarettes after having smoked for a gazillion years; I tried quitting numerous other times but with no success. . Wanting more from myself, from my will, I was not about the “patch.” I hate feeling weak, not in control. I’m not big on fitness, hating exercise; the gym is hell on earth. I attribute my physical conditioning to having lived an extremely active and physical life. That is another story for a different day. Knowing my nature, prone to start smoking at first excuse, I invested in a health aid; the bicycle. The way I figured it, having spent the money, I’d be forced to honor the new direction, albeit heading towards fitness. No turning back now. Back in my thirties, I used to run but knee problems knocked me out of the game. I never enjoyed running, it was always boring to me; not enough to keep my mind occupied. I kept a fast pace to overcome the boredom. My five times a week running regime was 7 miles @ 7 minutes a mile. 49 minutes of hell. Let’s just get it done. Nobody wanted to run with me. Now, much later in the game, turning fifty, in September, I opted for bicycles over the remaining choices. So back in March, I had a bicycle made for me. I began riding when it was still very cold. At speed, with the sub-zero wind chill factors, it was brutal. I remember thinking about mid August and the heat. Out riding in 30 degree weather, your feet and hands freezing, one’s thoughts tend to go to the extreme. Thawing out itself is a painful ordeal. I remember sitting in a gas station in Ringoes, NJ thinking my toes were frost bitten knowing I still had to turn around and head back. “Why was I doing this?’ This was lunacy. I reconciled it as “it’s all part of the investment.” Only a fool would pick up another cigarette, having endured this level of pain and suffering. But it is so much more than just about the cigarette. On the one hand it seemed crazy and obsessive that I was out riding in the extremes, towards what end? Albeit only a dusting, it had snowed that morning! To which cause was I committed, extreme cycling or non-smoking? To a great degree I am at fault for my discomfort. Inappropriately dressed, I was unprepared for the weather conditions. A proponent of the tenets of relativity, I tend to apply wisdom across the board. How we faire amidst many of our commitments is about our state of preparedness. Like my frigid Ringoes ride, I was not well prepared in taking the Director’s chair here at the Knapp Gallery. Actually, at first offer, I declined the Directorship, stating the position was outside my scope of experience. Nine months later, Barclay Knapp, my friend, once patron, past employer and mentor, leaned in, looked over his eyeglasses and said, “I want and need you to move to Philadelphia and run my gallery. Karl, I believe in who you are not in your experience or lack thereof.” I moved to Philadelphia. Expressed belief in somebody will carry them a long way; through a downturned economy, cold, wind and rain. It’s gonna have to as I commute to work this winter. In terms of Gallery preparedness, continued research, reading, poking, prodding and asking tons of questions keeps me fairly comfortable amidst the wind and wave of this sea of unfamiliarity. Beyond a sense of comfort, I’m exhausting every available avenue towards success; winning is the only option. Over time, The Boss has learned that I am a results oriented individual; that I stand in my commitments. He knows I will do whatever it takes to get the job done. I will deliver. My nature is to finish well in the things that I start. 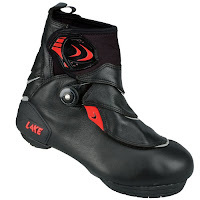 On an ending note: Through research of a different kind, I have found a winter bicycle riding shoe that will keep my toes toasty. Though a bit pricy, they’ll be well worth the investment. Better gloves will help out at the other extremity.